This updated, fabulous large Key West style top floor 2 BR plus Large Private Loft condo has the BEST of everything! 2200 ft of living space, sleeps up to 8, and has 3 Bathrooms. 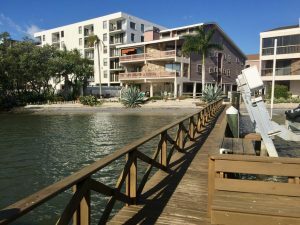 Sits directly on the Inter coastal Waterfront with Heated Pool, boat ramp, fishing dock, and private beach at the complex!! Renovated and gorgeous, it is the largest unit at the Indian Sands complex and was the builder’s unit!!. Soaring cathedral ceilings, well appointed granite kitchen with stainless appliances, wine frig, and bar. Also includes single car GARAGE and additional single reserved covered parking space. Private balcony(with glass closing doors) overlooks the inter coastal waters, the dock and the complex beach. There is also a rear deck off the Master Bedroom. Steps to the GULF of MEXICO via a public cut thru just across the street!! You will feel at home and have plenty of space for your group up to 8 people and at a fabulous price compared to those across the street!